Admittedly I have an addiction and somehow convinced myself that I needed a short bull barrel upper for maneuverable precision varmint hunting. For some time I have been eye balling the ASA 16” bull barrel which they claim should deliver sub-MOA accuracy and I have also been curious about their side charging handle receiver as well. ASA has a bit of a storied history as does its new second owner Joe Sirochman. The company originally had a bit of a rocky past under the initial ownership, however everyone loves a great turnaround story and this is one of them due to the new owner. A couple months ago. I did schedule a factory tour which went sideways when some schedules were mixed up. The outcome of that was that Joe reached out directly to me, profusely apologized for the mix up and ended up providing me with quite a bit of background that you just will not find on their site. Again in this case good things came from a challenging situation. After American Spirit struggled under the founding ownership, Joe Sirochman stepped in and purchased the company and brand, but the reasons why were particularly interesting to me. Joe came from a background of automotive manufacturing and machining and in fact founded JPS Manufacturing and JPS Motorsports. Today American Spirit Arms is part of that manufacturing family. Some people buy companies because they just want to make make money other a specific passion about the product, however during our conversation Joe was clearly passionate about the well being of his employee family, the product, and brand. He explained that his father spent his entire career at Bethlehem steel only to be laid off suddenly without warning because the factory outsourced to China. The event devastated their family. Joe vowed that any business he owned would use American labor and materials and most importantly care about it’s employees. Joe is also a patriot and bought the company in part because of the name, “American Spirit Arms”. This passion and commitment recreated and resurrected a company based on ethics, attention to detail, refusal to us any imported materials, and an ISO-9001 Certified Aerospace manufacturing and quality process. This means along with the usual attention to detail, there is a paper trail and documentation at each and every step in the manufacturing and inspection process. All materials are certified domestic sourced and each and every part is actually hand inspected by Joe himself before they leave the factory and stamps off on each and every invoice. This is both an impressive personal dedication and expensive attention to quality. With all this background, you can understand why I was excited about adding a ASA 16” Bull Barrel Side-Charging Upper to my Liberty Safe. For this build, I set up the ASA Side charge receiver including a chrome carrier and topped it off with a Young Manufacturing bolt. The big fat 16” ASA .223 Bull Barrel was slipped into the receiver with a low profile ASA gas block and White Oak stainless gas tube. I am a fan of long handrails because they give loads more room to find a comfortable handhold or support in less than optimal situations. Samson offers a unique and lightweight option in the Evolution Series and of course I chose the long 12.37” version. This handrail comes with 2 - 2” picatinny rails which provides mounts for my Atlas bipod and and extra rail for hopefully a laser designator down the road. For testing, I mounted the upper to my Holding Precision billet lower and clipped on my Nikon Monarch 8-32X50ED scope with a PRI Gator Grip Platform Quick Release mount. The barrel finish is exceptional. 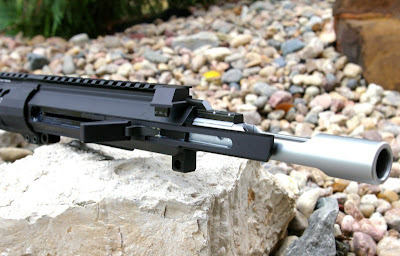 Actually probably the nicest AR barrel finish I have seen especially when compared to the typical black rifle barrels. The only other AR barrel I have seen which has this level of attention is JP. ASA starts with ER Shaw barrel blanks and then chambers to national match chamber dimensions, target crowns the barrels, and then turns and finishes the barrels to the selected profile. 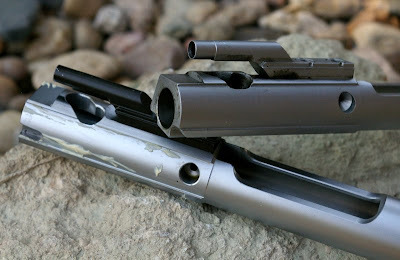 One of the interesting techniques is that they turn the barrel crown starting from the inside to the outside. This assures the rifling has a burr free finish and maximizes accuracy. 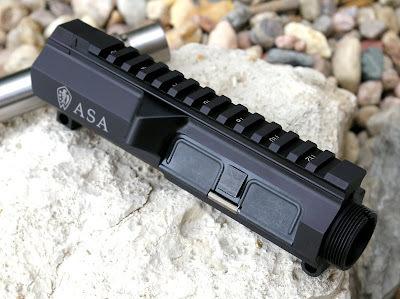 The recessed crown is ASA’s own proprietary design which they believe squeaks a bit more accuracy out of their barrels. While the chamber is being cut, the bore is flooded with coolant from the muzzle end to assure chips flow away from the cutting edge. American Spirit then hand laps each barrel for optimal accuracy... all little details which deliver a beautifully made barrel. 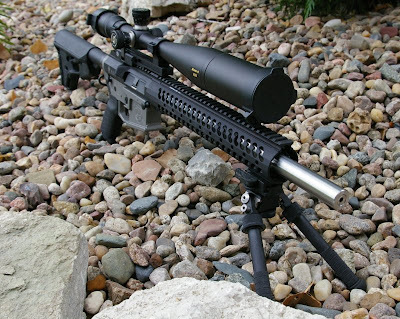 The 16” barrel length itself has a few really interesting attributes such better maneuverability, as a higher potential rigidity and almost a 1lb weight reduction over similar 20-22” barrel varmint barrels. That is 1lb less weight to lug around in the field while you are varmint hunting. The ASA patented non-reciprocating side charging receiver is unique for a number of reasons. The upper receiver is made beautifully from 7075 T6 billet aluminum and is a little oversized and beefier than a typical Mil-Spec upper receiver and then Type III hard anodizes to a deep dark finish. 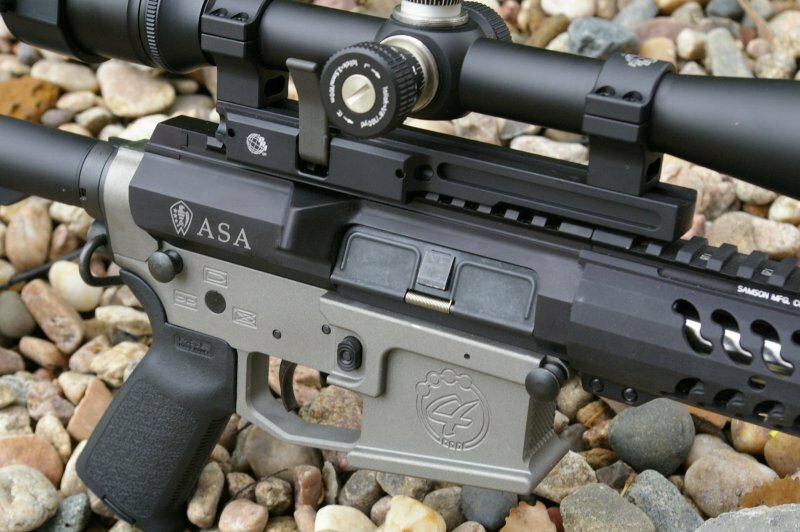 ASA mills a small notch into a standard AR spec carrier; other than that modification the carrier is the same as any other AR carrier. I slipped in a Young Manufacturing bolt, cam pin, firing pin, and retaining pin to complete the BCG (Bolt Carrier Group). 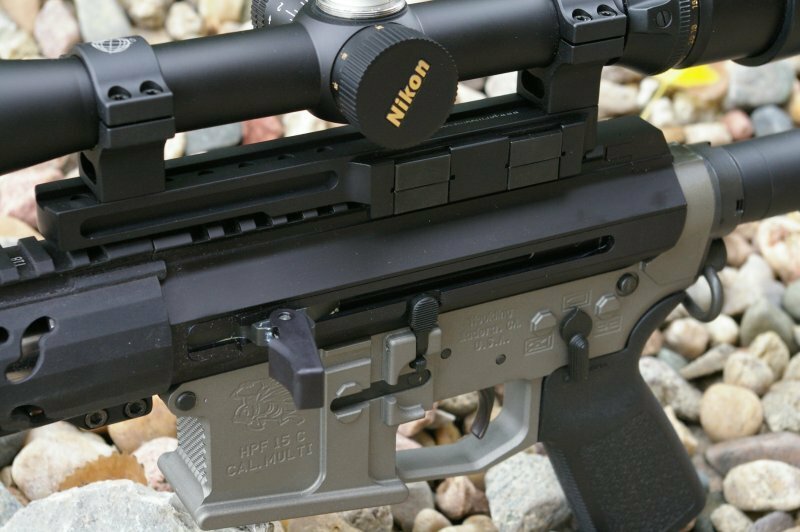 The American Spirit Arms AR-15 M4 Side Charger Upper Receiver is compatible with any AR barrel and AR-15 Mil-Spec lower receiver. Of course if I would have had the extra cash, a matching ASA lower would have been the obvious choice. In this case, I pinned the ASA receiver to my Houlding Precision billet lower receiver with Geissele trigger for testing. 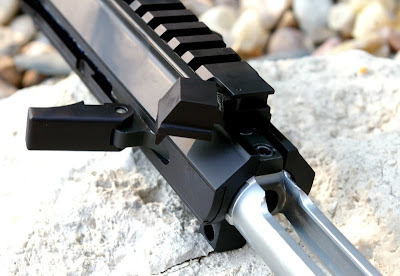 The brilliantly simple ASA charging handle folds out of the way when not in use, but is easy to grab when you need to operate the bolt operation. 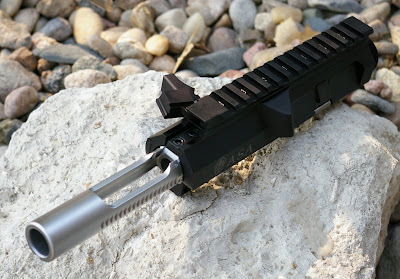 I am sure retraining away years of grabbing a rear charging handle is possible for tactical work, however for more casual bench and varmint shooting this side charging feature is far more comfortable and convenient. Reach up with the left hand and pull back on the charging handle to slip a round in the chamber all without raising your head off the scope... way convenient on the bench punching groups or while laying prone with a critter in the crosshairs. 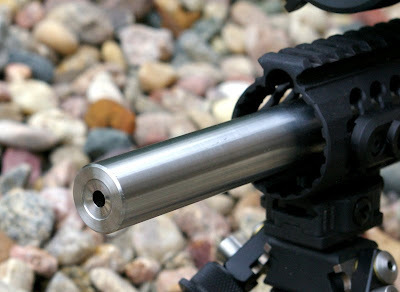 The rear flip open carrier door at the back of the receiver locks closed when pinned to the lower receiver. With the rear lower receiver pin out and the upper tilted forward the bolt can be removed just as any other can. The side charging components are removed from the rear as well. 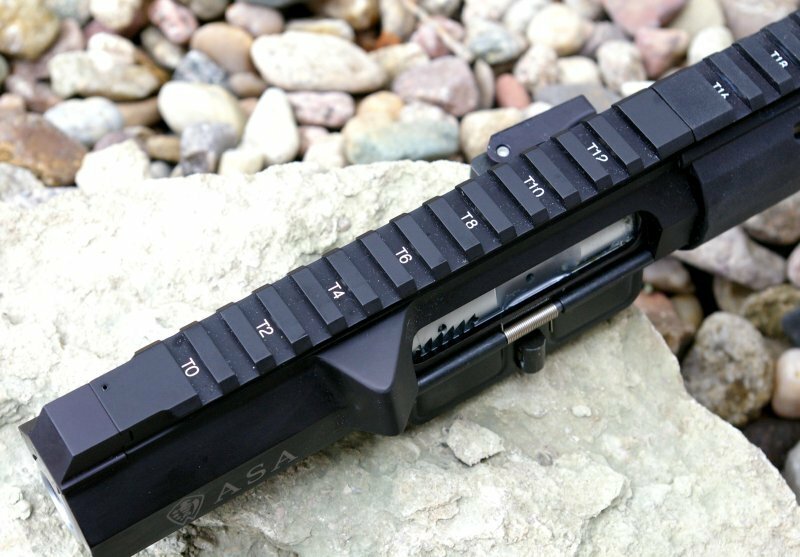 Although about twice the price of a typical forged Mil-Spec upper receiver, the ASA side charge receiver is a pretty cool setup and definitely convenient for a hunting and target rifle. The question will come up regarding whether the side charge receiver affects reliability and I will say that it has not at this point and operated smoothly and flawlessly. The receiver arrived with the side charged parts well lubed and I have maintained it that way and have had no issued. The mechanism itself is brilliantly simple so I would doubt any issues will creep up. I am a fan of slim handguards and find them easier to handle, so it should come as no surprise that I really liked the features of the lightweight Samson Evolution series handrail chosen for this build. Without a question, I would use this very sturdy rail again. 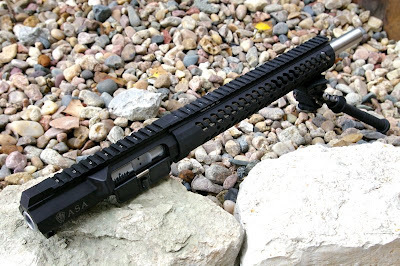 With the marginally fatter ASA upper receiver, you do need to use a file to trim just a bit were the Samson handguard keys into the upper receiver; on Mil-Spec upper receivers this is not required. It was a simple modification that took only 5 minutes of file work and is hidden after installation. American Spirit Arms not only claims, but guarantees that each of their barrels are MOA capable. Some ASA barrels, including this 16” bull barrel, guarantee 1/2-MOA accuracy. 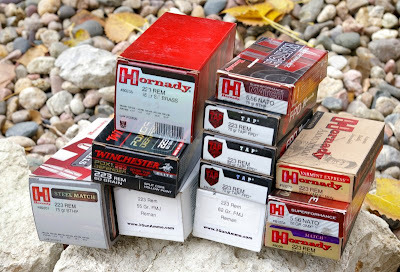 Accuracy guarantees of course mean a solid benchrest, with a decently powered optic, good ammo, and someone capable behind the trigger... they do not mean with iron sights, hand held over the hood of your truck, with randomly selected ammo, or with an inexperienced trigger jerker behind the rifle. 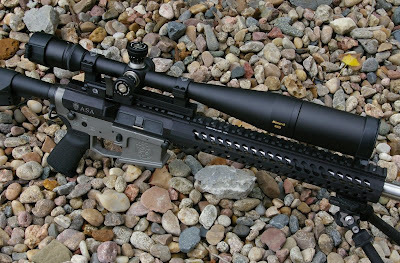 MOA (about 1” groups at yards) is actually a good goal and most high quality AR barrels are capable of right round that goal; 1/2-MOA guarantee is another matter altogether. My Nikon Monarch 8-32X scope, Geissele triggered Houdling lower receiver, and Atlas bipod did help me meet ASA’s MOA guarantee. The first goal is to find ammo which the barrel likes best. Generally I have found that the Hornady FPD TAP ammo line performs extremely consistent and started there however I was surprised to find that the barrel delivered tight sub-1” 100-yard groups with most quality ammo including my 62gr 3GunAmmo.com remanufactured rounds. Go figure a big fat heavy bull barrel made to precise tolerances will shoot well. 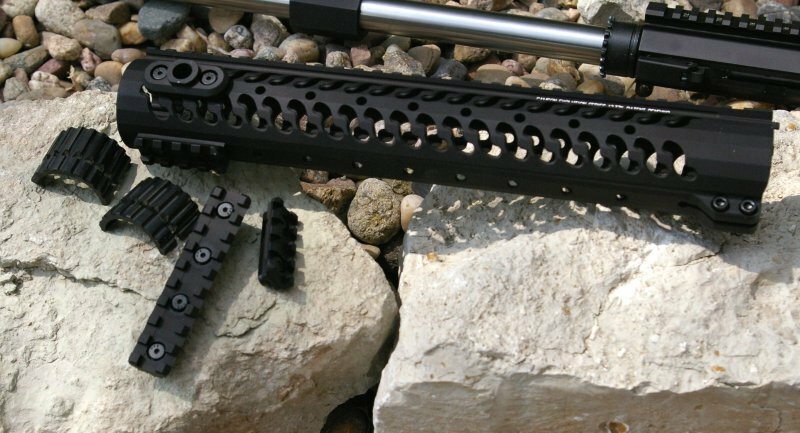 This upper combo is an outstanding supplement to someone who already has an AR and wants a dedicated precision upper for varmint, predator, and benchrest shooting. 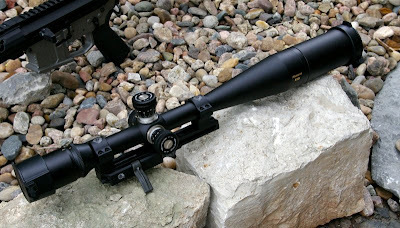 Although the high powered Nikon Monarch optic enabled impressive accuracy, I would probably scale down the magnification a bit to one of Nikon’s 3-12X models to provide a lower power magnification setting to hit targets on the move. Generally a forged Mil-Spec receiver is about the same as any other forged Mil-Spec receiver, however ASA Billet receiver is clearly upping the game. This is a beautifully crafted upper receiver with a really convenient side charging feature... super convenient actually while in prone position. The barrel is gorgeous and the Samson handrail brought it all together into a nice tight compact package. I can see that this will be a well used set up for years to come that will put many a destructive/invasive critter in thier place.